2016 Honda Pioneer 700-4 Review of Specs / Development / Features + More! 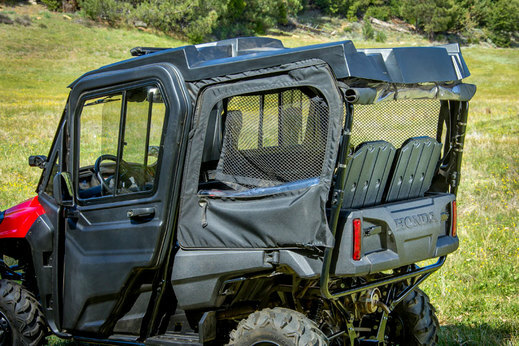 Chances are you have heard about the Honda Pioneer 700-4. 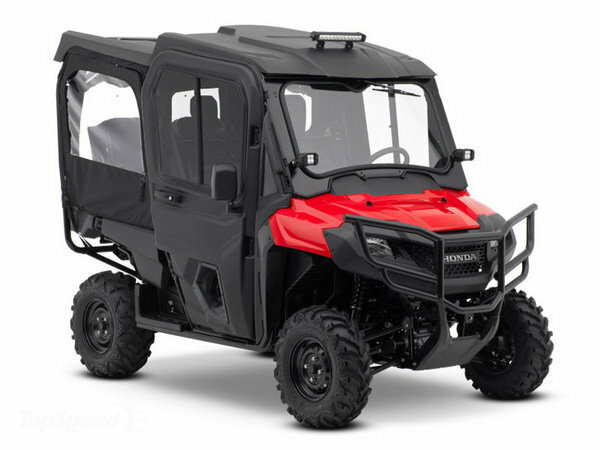 Unless you’ve been sleeping under a rock since Honda released this all new Side by Side / UTV back in mid 2013. They started arriving at dealers in August of 2013 and have been nothing short of a HUGE success since day one. We still can’t keep the Pioneer 700-4 as “stock” and haven’t been able to since their release. Every single one has been pre-sold with deposits well before that next 18-wheeler comes rolling in with another shipment. 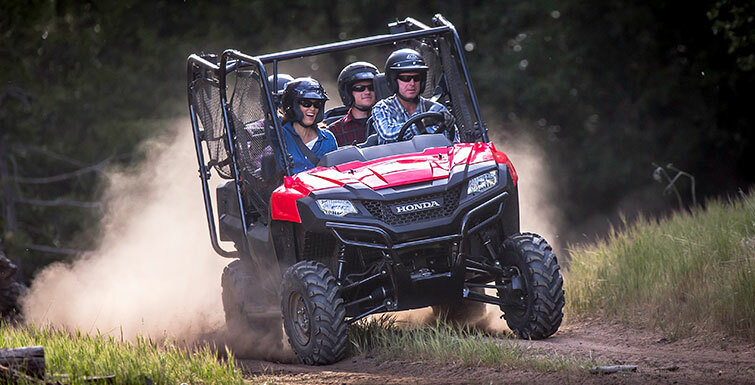 Honda has told us dealers time and time again that they are bumping up production numbers to help fill the demand for the Pioneer 700-4. They have delivered and fulfilled their promises but it still isn’t anywhere near enough. We still have customers beating down the doors wanting them. 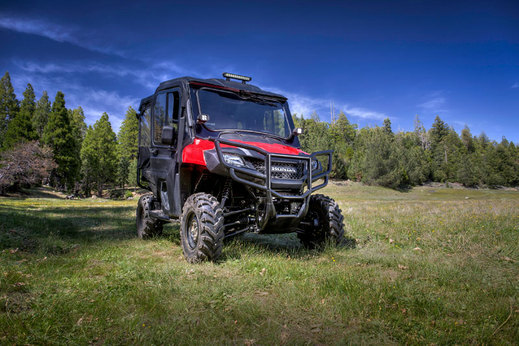 After finding out about the latest Pioneer 1000 release from Honda we will have to cut them some slack as they have been working on bringing that bad machine to us before the end of this year. That’s a completely different article though and in most aspects a different market segment than the Pioneer 700 & 700-4 models. These are more budget friendly with MSRP’s starting at $10,299 and capping out at $11,899 whereas the Pioneer 1000 will start at $13,999 and cap out at $17,199 for the 1000-5 Deluxe. If you haven’t already, make sure to at least click over and check out the 2016 Pioneer 1000 & 1000-5 and the Pioneer 1000 Accessories list as it is something to definitely drool over. 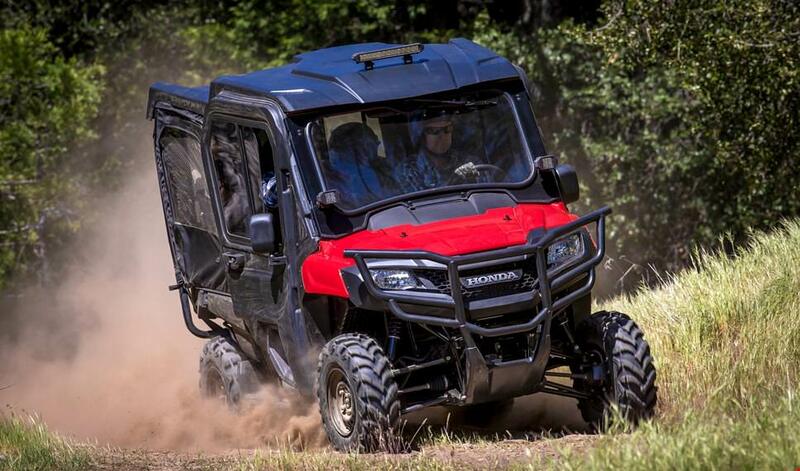 You can find the 2016 Pioneer 1000 horsepower details here. 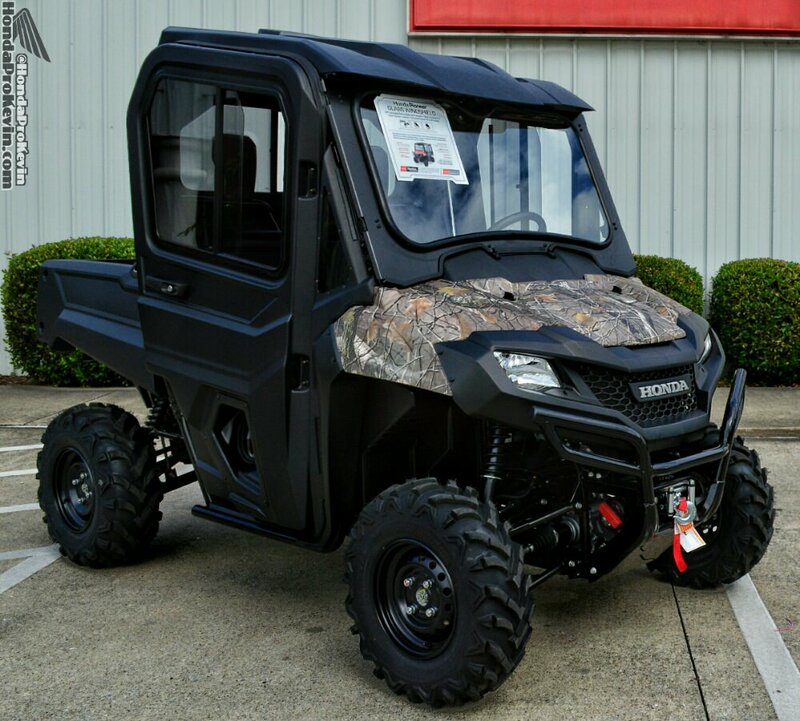 Not everyone wants to spend that kind of change for a Side by Side / UTV / SxS in 2016 and that is where the Pioneer 500, Pioneer 700, Pioneer 700-4 come in and steal all the thunder. 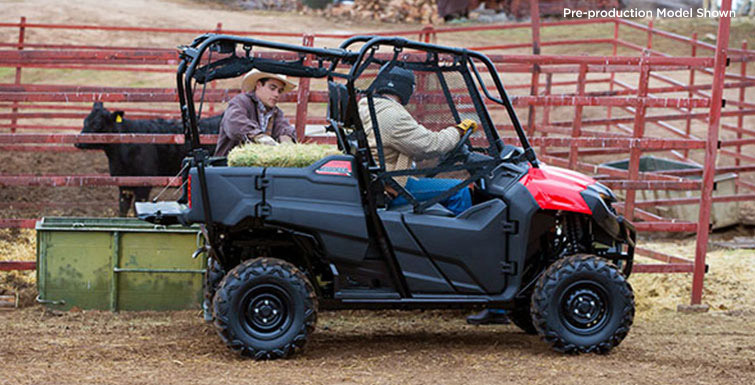 No other Side by Side on the market comes close to matching the bang for the buck features that the Pioneer 700-4 offers for 2016. 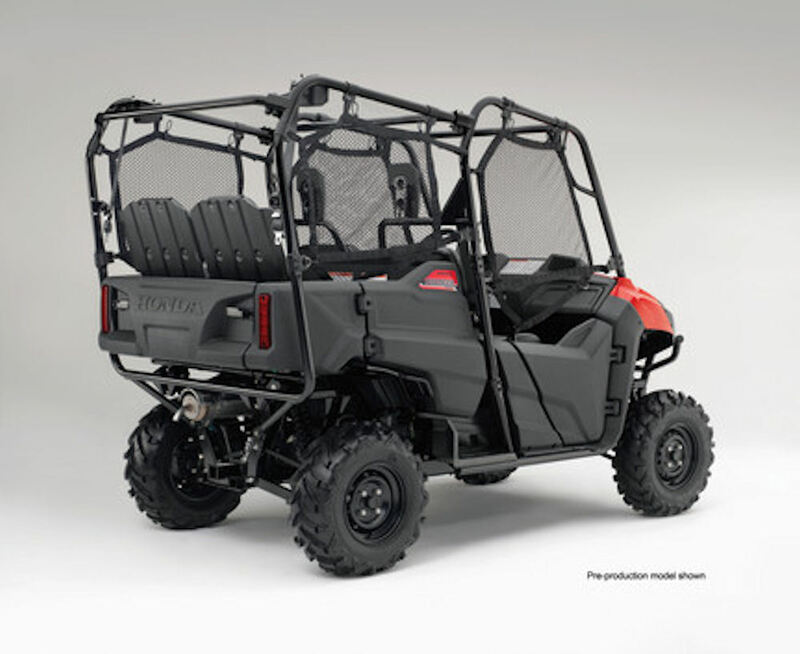 2016 Honda Pioneer 700-4 changes and upgrades? The 700-4 will not be receiving any major upgrades this year. For one, it’s only in the 3rd year of production so before they do any major redesigns or upgrades they will want to recoup some of the R&D costs associated with putting this unit on the market. Honda did a few slight changes / upgrades in 2015 – giving the 700-4 a new intake tract, dual-rate front suspension, dual spark plug setup. Honda never made a big announcement to let this be known as they do frequently with certain models. They will at times not even let us dealers know that they made slight tweaks to improve a model. 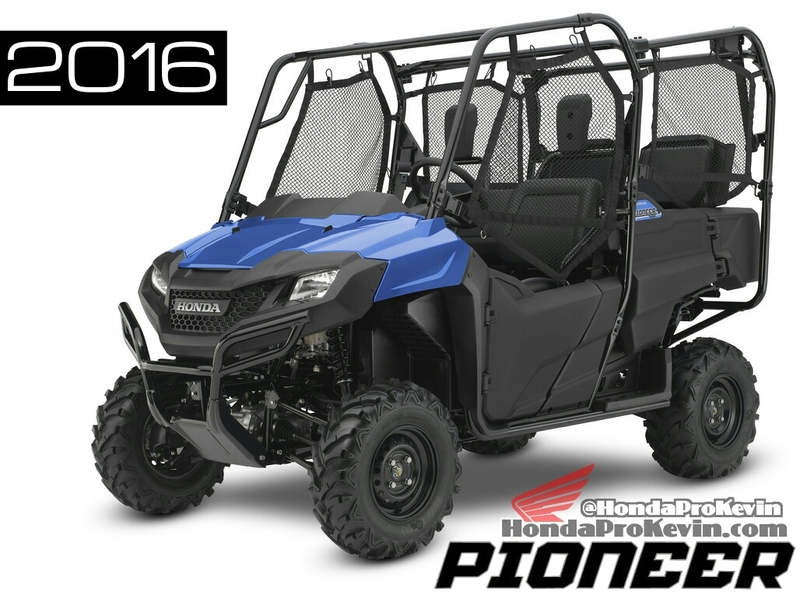 The most noticeable change to the 2016 Pioneer 700-4 is the addition of a new color – Blue. 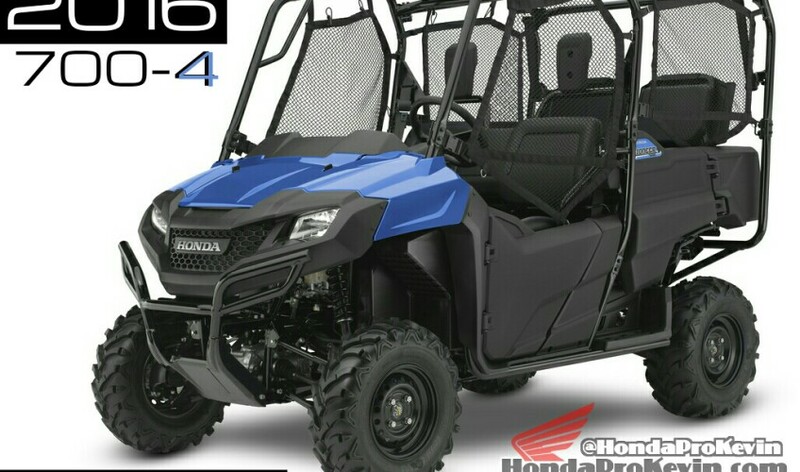 Personally I think it’s going to be a huge hit as doing this bright of a blue hasn’t been the norm for Honda on either the ATV or SxS model lineup over the years. They’ve played around with blue the last few years on the ATV side of things but it’s been a dark blue. Honda press release info: Now you don’t have to choose between a two – person or four – person Side-by-Side: The all-new Honda Pioneer boasts an innovative convertible design that allows the two rear seats to fold into the bed. 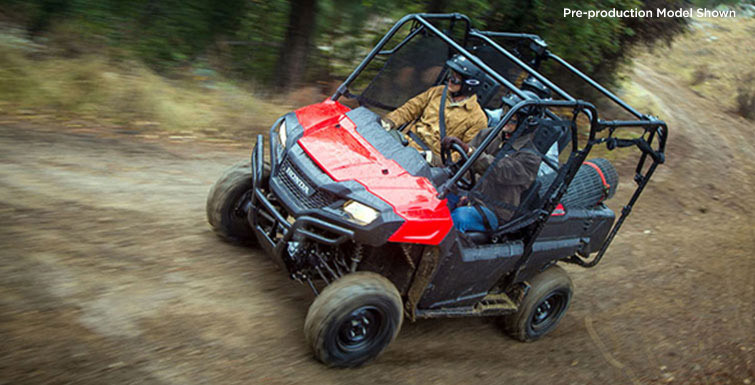 Owners can opt to use the Pioneer with two-seat, three-seat or four-seat configurations. Best of all, the rear seats fold quickly and easily without the need for tools, and once folded away the Pioneer’s tilt-bed space can be fully utilized. 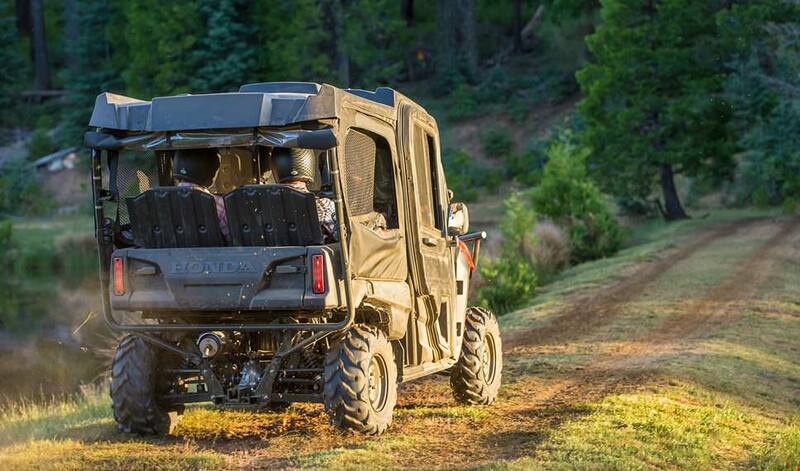 Long-travel suspension combines a comfortable ride with high-performance handling, and helps give the Pioneer the load capacity to haul 1000 pounds or tow 1500 pounds. It will be available in three colors Red, a new Blue added to the mix, and the new Honda-designed and trademarked Honda Phantom Camo. 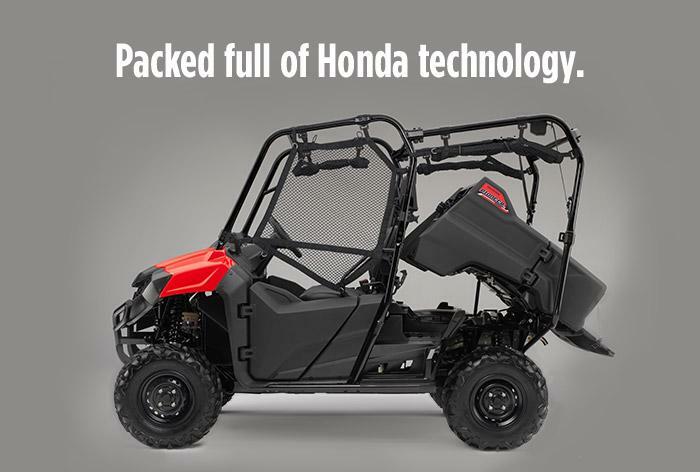 Powered by Honda’s proven fuel-Injected 700cc-class liquid-cooled OHV single-cylinder four-stroke engine that features an automotive-style automatic transmission with hydraulic torque converter, three forward gears and reverse. All-new convertible seating design offers the versatility and adjustability of two, three, or four-person seating configurations. Seating arrangement can be quickly and easily changed thanks to a folding, stow-away rear-seat design, and provides full bed space and tilt function while in the two-person configuration. 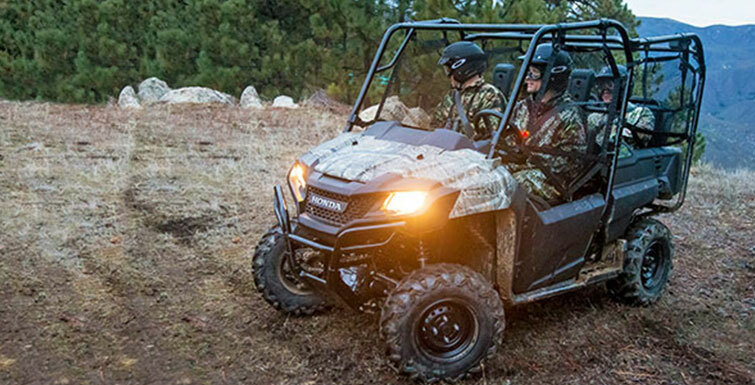 With the overall dimensions of a two-person design, the Pioneer maintains a high level of maneuverability while still being able to seat up to four people. Long-travel suspension with 7.9 inches in front and 9.1 inches in the rear provides a plush ride with class-leading stability. All-new rugged, aggressive and exciting styling. Three colors available for 2016 including Red, the new addition of Blue, and the new Honda-designed and trademarked Honda Phantom Camo. Load capacities of 1000 pounds hauling, or 1500 pounds towing. Americans appreciate versatility. Give us a multi – tool and a little baling wire, and we can fix just about anything. 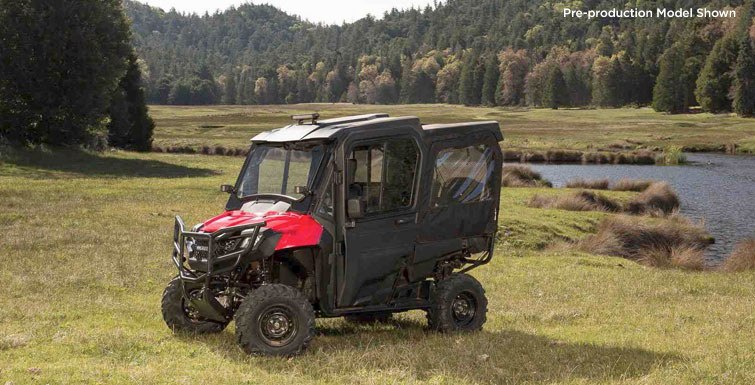 That’s the spirit behind Honda’s Pioneer 700-4, the most versatile side by side on the planet. It’ll take you just about anywhere a side-by-side can go – along with one, two or three other passengers or a bed full of cargo. You’re going to find it makes life and work a whole lot easier – and more fun. 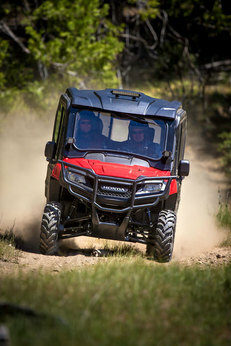 Best of all, the Pioneer 700-4 is probably the best-built side-by-side anywhere, and that’s a real asset when you’ve got others depending on you to get where you’re going and back again in safety and comfort. 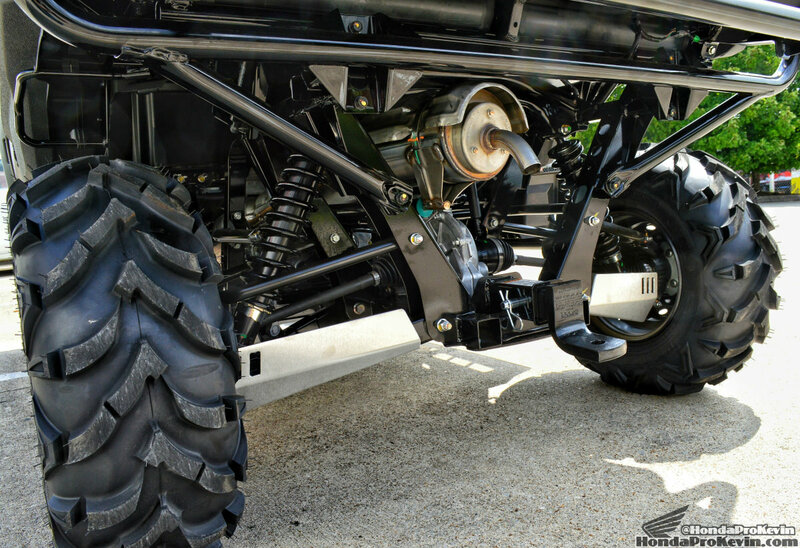 Equipped with a dual-rate suspension spring it’s designed to give you a smooth ride while still providing plenty of travel and superior load-carrying capacity. 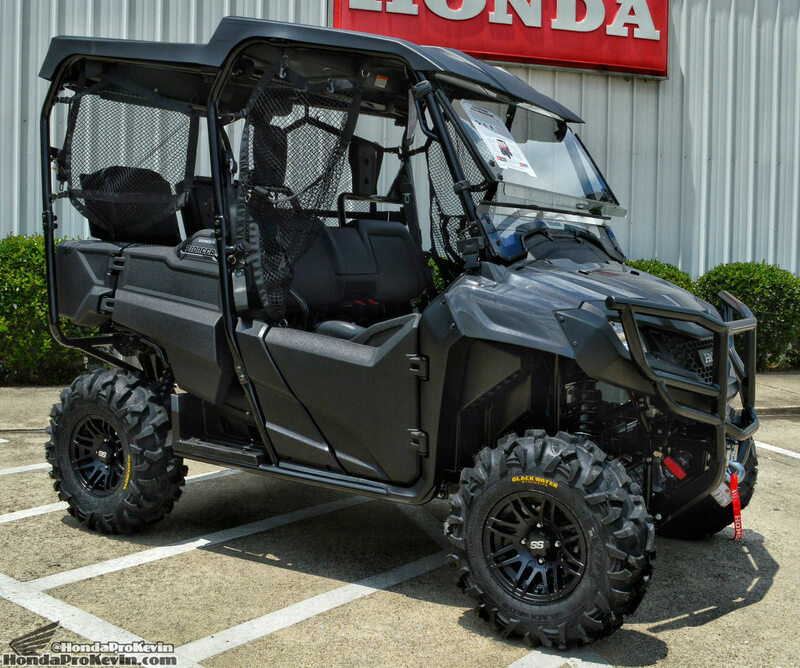 The 2016 Pioneer 700-4 – Designed by Honda Research and Development in Ohio, and built at Honda South Carolina (using domestically and globally sourced parts), have plenty to offer off-road enthusiasts who like to use their machines to work hard and play hard while also bringing folks along for the ride. 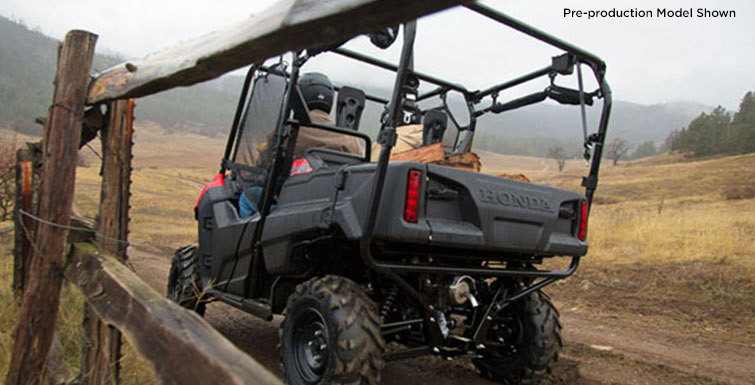 Creation of the Pioneer models began with an all-new chassis formed around Honda’s proven 700cc-class liquid-cooled OHV single-cylinder four-stroke engine coupled to a unique automotive-style automatic transmission. 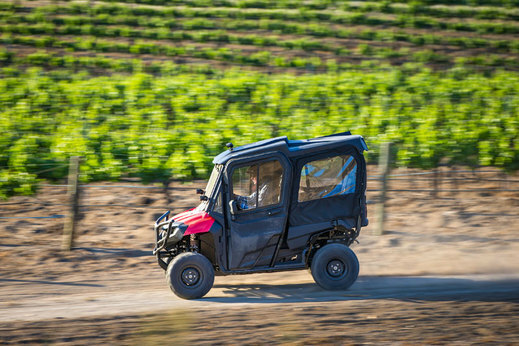 This brand-new chassis incorporates a long-travel suspension system for a smooth ride over tough terrain, and the distinctive, all-new bodywork comes standard with integrated doors and headrests. 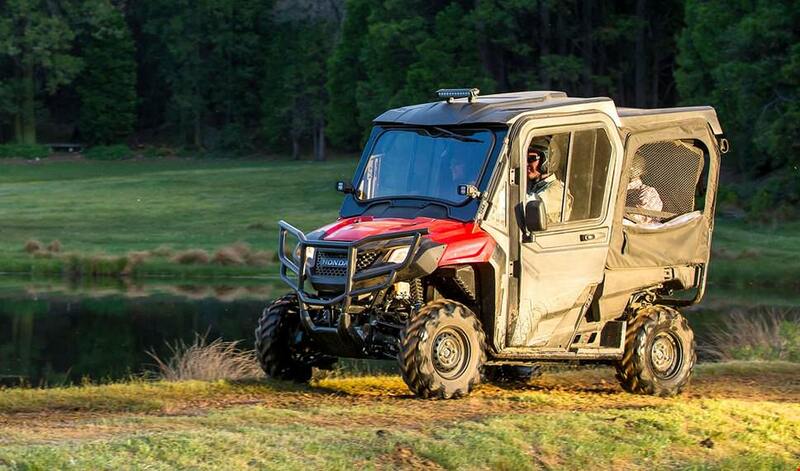 The ability to carry hefty loads over many different kinds of challenging terrain also ranked high in design priority, as well as the ability to tow big loads. 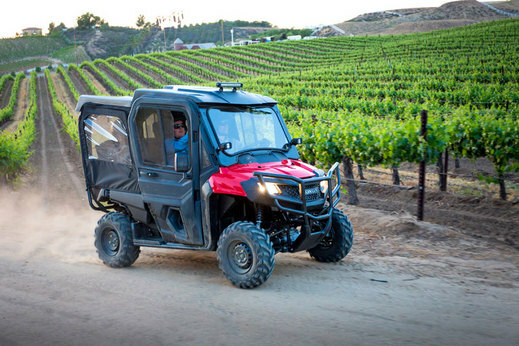 And perhaps best of all, these two machines deliver fantastic value, slotting into the popular, rapidly expanding multi-purpose category of side-by-sides with the two-person Pioneer 700 at $10,299, while the Pioneer 700-4 starts at $11,899 – about the same neighborhood where some competitor two-seat machines live. Bottom line: once again, Honda is offering innovative new models packed with Honda’s fabled quality, fit and finish at a superior value. 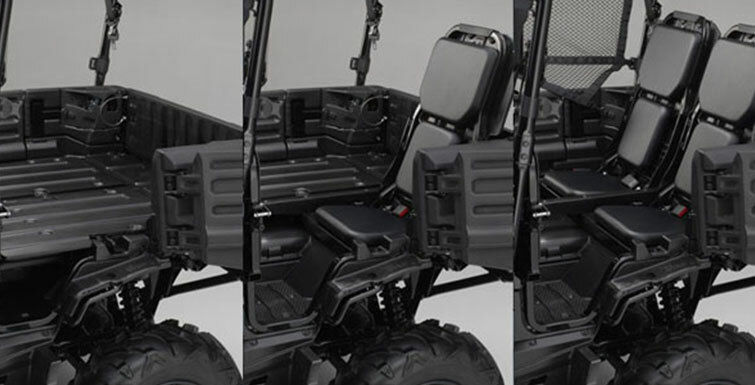 One of the big attractions of the Pioneer 700-4 is its convertible seating arrangement; it can be quickly and easily converted from two-seat to three-seat or four-seat configurations and back to an open load-carrying bed without the use of tools – an industry first. Each of the two rear seats simply tilts up out of the bed structure with the release of a latch and locks into place, converting to three-person or four-person capabilities depending on the needs at hand. 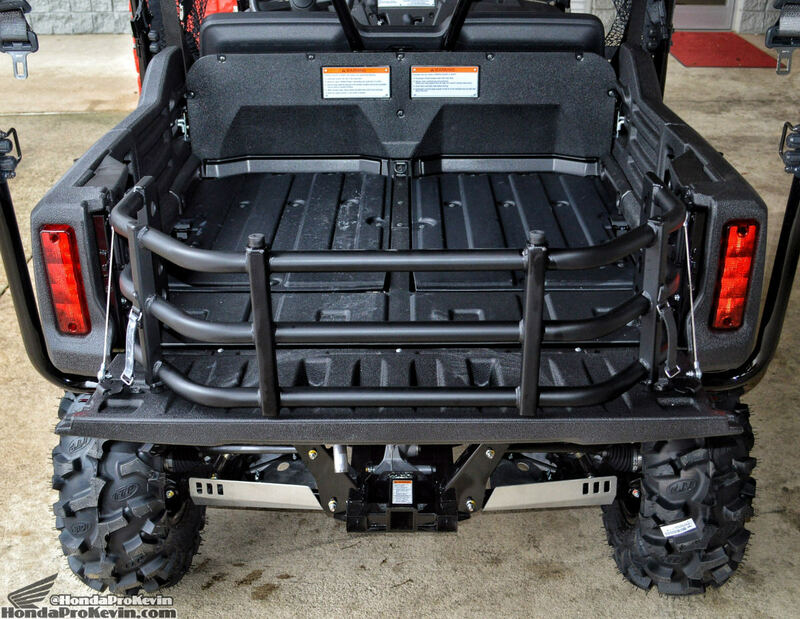 The rear passengers can also easily access the three-point seat belts, which are located up on the Roll Over Protection Structure (ROPS) where they stay out of the way when not in use. And when the seats are folded in the down position, the bed maintains its full tilting functionality. 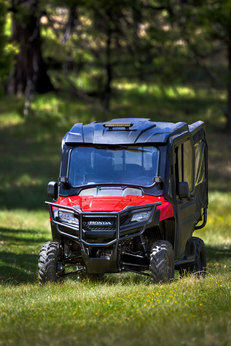 The tough and durable heavy-duty steel frame used by both Pioneer models features a wheelbase just slightly longer than the Big Red’s – 76.8 inches versus 75.7 inches – yet overall length has been reduced just a pinch and overall width is narrower by nearly three inches to make the Pioneer models more compact with more agile handling. 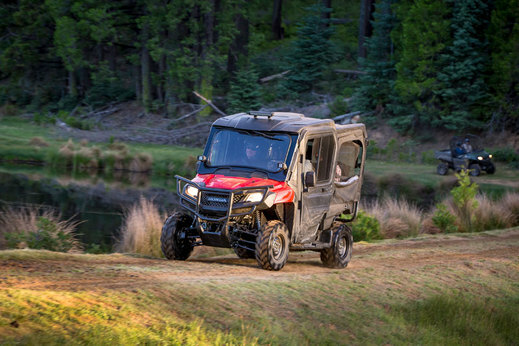 This new configuration also gives the Pioneer a tight 14.8 feet turning radius and there’s plenty of ground clearance available – 10.3 inches. However, perhaps the most telling specification focuses on suspension travel: both new models deliver comfortable and well-controlled 7.9 inches of travel via double-wishbone independent front suspension system, while the double-wishbone independent rear suspension system (IRS) provides a full 9.1 inches of travel for excellent off-road capabilities. The twin rear shocks are adjustable for spring preload, so it’s easy to adjust the rear suspension for added comfort during recreational use, then quickly ramp up the spring preload when it’s time to carry heavy loads. 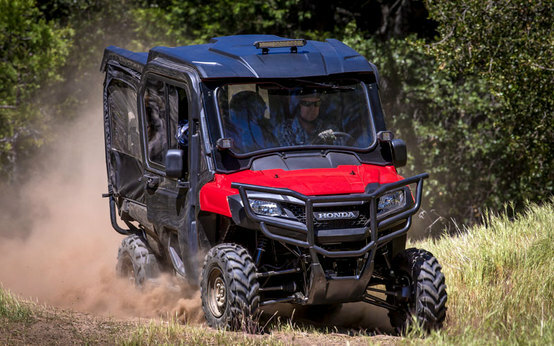 With this 2.0-inch gain in travel at both ends, these new Pioneer models deliver an appreciably plush ride whether it’s on the trail or at the jobsite. 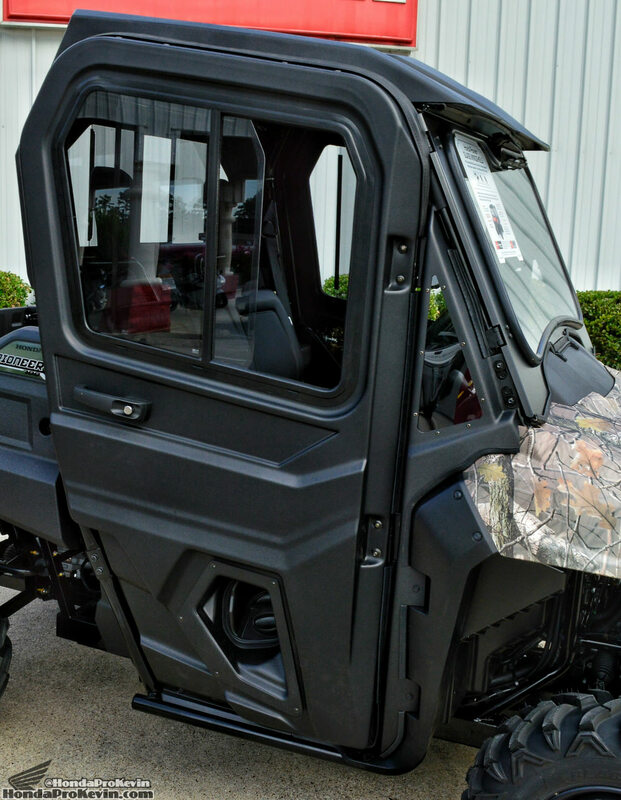 In addition, both versions of the Pioneer 700 also feature new front tires sized 25 x 8-12. 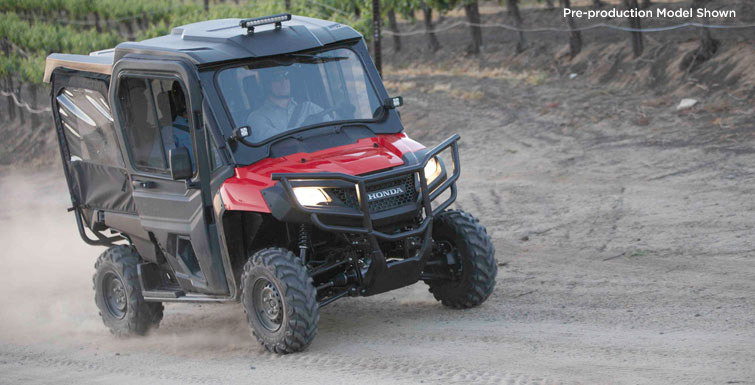 These new tires help give the Pioneer improved steering feel and more agile steering response. Another very significant innovation involves a new engine mount system developed specifically to help tune out vibration and produce a noticeably smoother ride. Thanks to a newly developed engine-mounting subframe and accompanying vibration-isolating bushings, every contact point for the driver and passenger – steering wheel, handholds, floor, seat bottom and seat back – now transmit noticeably less engine vibration. The result is markedly improved comfort and a newly elevated, high-quality feel. 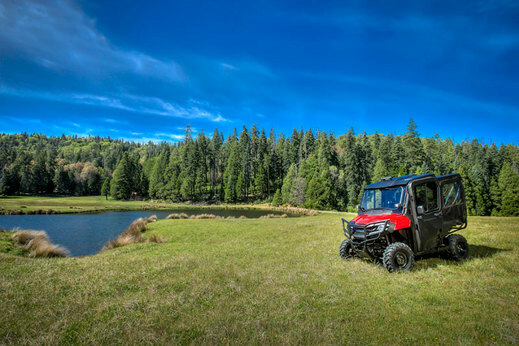 Both Pioneer models are powered by Honda’s proven 675cc liquid-cooled OHV single-cylinder four-stroke four-valve engine with Programmed Fuel Injection (PGM-FI) for spot-on fuel metering under a wide variety of operating conditions. This muscular yet smooth-operating powerplant delivers strong acceleration and good top speed, and it’s coupled to an automotive-style Honda automatic transmission that features a hydraulic torque converter, three hydraulic clutches and an Electronic Control Module (ECM) to automatically select one of three forward gears and one reverse gear. The ECM monitors throttle opening, vehicle speed, engine rpm, gear selector position, brake application and engine oil temperature for optimum performance. Also, on downhill slopes the transmission provides positive engine braking that supplements the hydraulic disc brakes for slowing power, technology that is superior to side-by-sides with electronic engine braking systems that can result in inconsistent performance in real-world conditions. 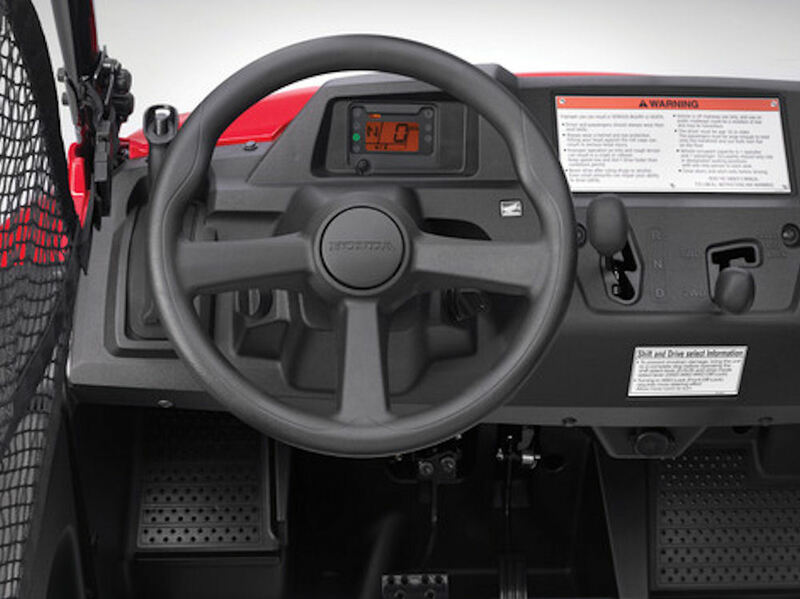 New to the Pioneer models is a dual shift-mapping program that automatically selects between two transmission shifting modes – either Cruise or Sport mode – for optimum shift timing depending on the driver’s pattern of throttle operation. During aggressive use, the Sport mode kicks in and holds the transmission in gear longer before shifting to deliver more aggressive performance. 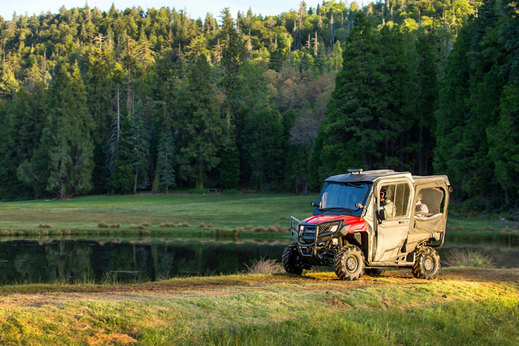 During more casual operation, the Cruise mode allows the transmission to shift up sooner for more casual performance and extended range from the Pioneer’s 8.2 gallon fuel tank. All in all, the driver enjoys optimum performance – automatically. To convert all that power into terrain-grabbing traction, both Pioneer models feature full-time true 2WD for improved traction. 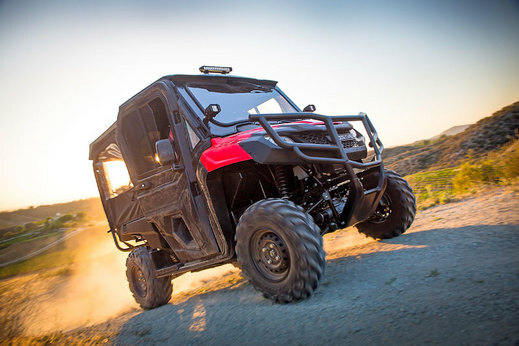 Thanks to a new rear-wheel drive setup that now incorporates a non-differential rear end – one related to the setup used on Honda ATVs equipped with IRS – the Pioneer delivers superior drive characteristics. When the going gets especially tough, a handy gearshift selector makes it easy to positively engage the 4WD mode, and there’s also the option to engage the front differential lock for maximum pull. 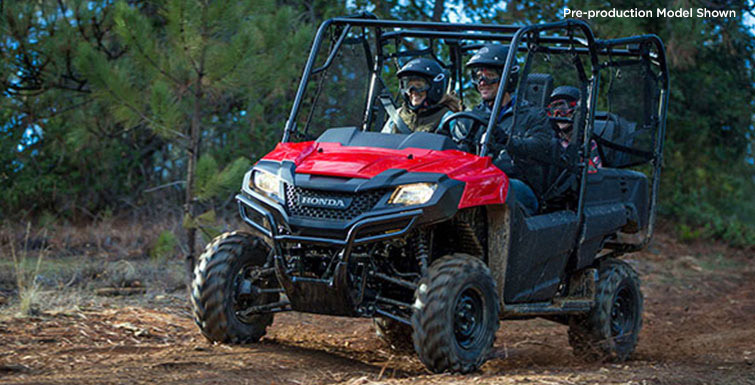 In keeping with the design of all Honda side-by-sides and ATVs, the Pioneer forgoes a belt-style transmission for the more positive automotive-style automatic transmission and durable shaft-drive design. 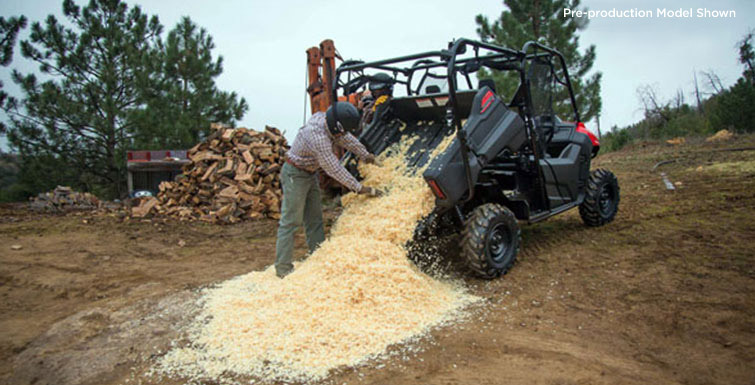 When it’s time to load up the Pioneer and get to work – whether it’s supplies and tools on the job or an entire camping setup for a multi-day backwoods trip – both the Pioneer 700 and Pioneer 700-4 are more than up to the task. 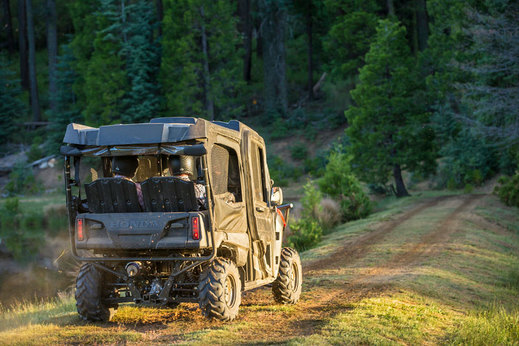 The versatile tilt-bed is rated for an outsized 1000-pound hauling capacity, plus the Pioneer offers an impressive 1500-pound towing capacity. 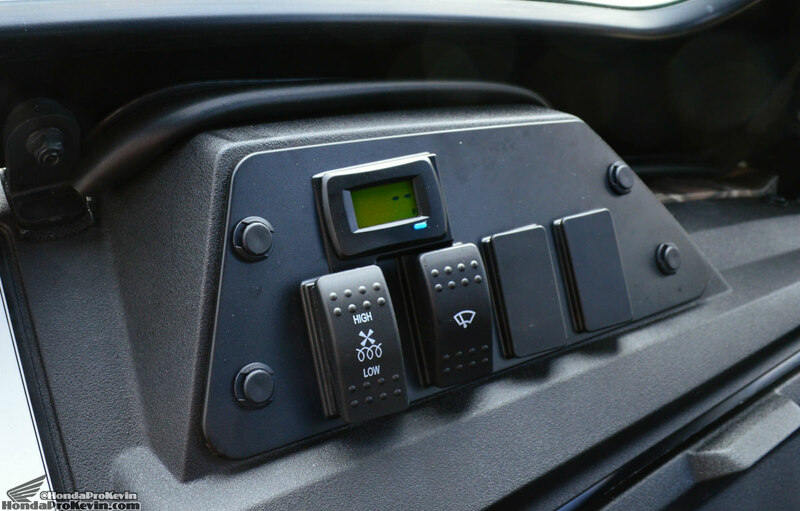 Multiple D-rings on the bed and wall of the cargo area provide convenient tie-down points for securing cargo while underway – a welcome convenience. 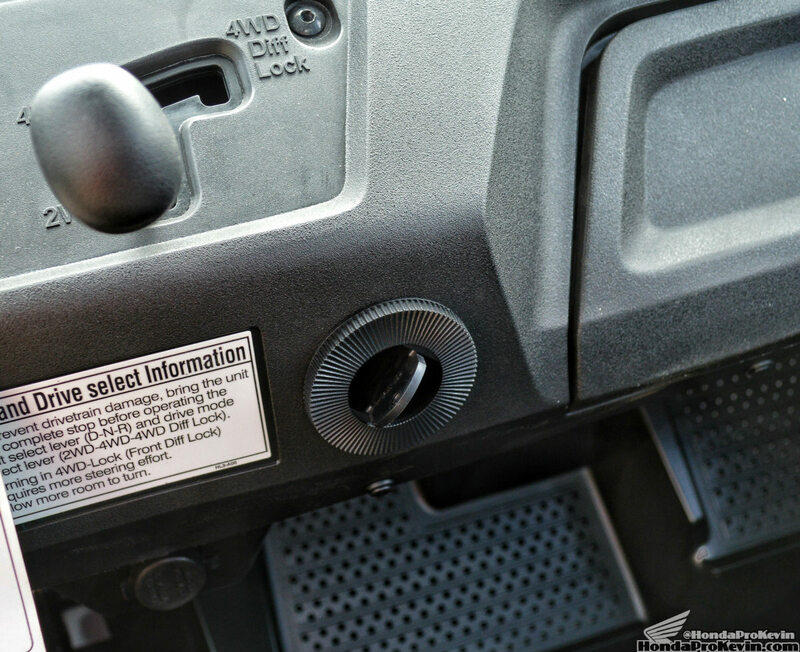 Both versions of the Pioneer abound with Honda’s distinctive attention to detail: Redesigned 37.5 watt headlights provide a more even distribution of light for driving after dark; an improved air intake system is more resistant to ingestion of dust and water; a higher AC generator output – from 410 watts on Big Red to 450 watts – provides power for added accessories; increased fuel capacity adds greater driving range; a larger-capacity, sealed glove box provides more room to pack items, and much more. 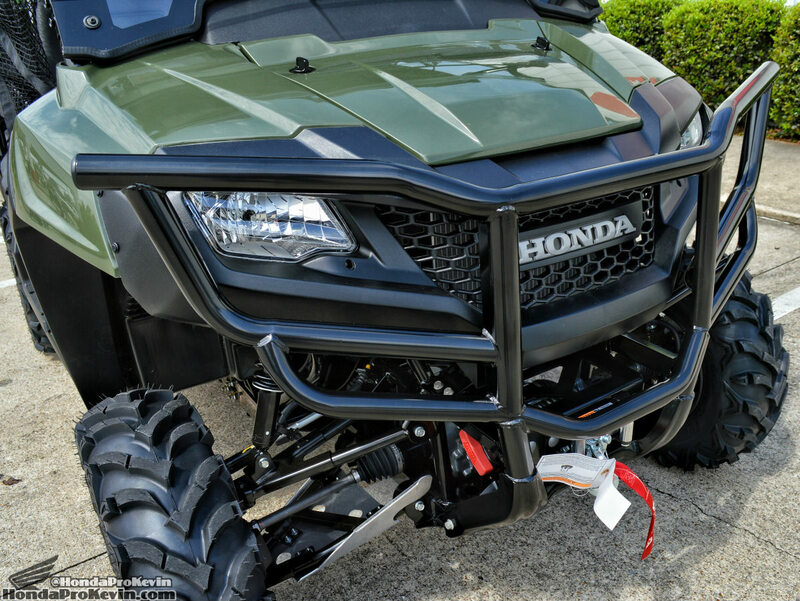 There’s also a full line of Honda Genuine and Signature Accessories – over 50 different items – allowing owners to configure their Pioneer to meet their specific needs. 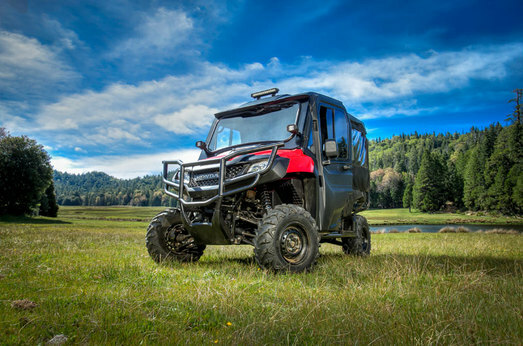 It all adds up to an innovative Pioneer duo that meets the widely varied needs of off-road recreational users, hunters, outdoor-oriented families, hard-working job sites, and everything in between. 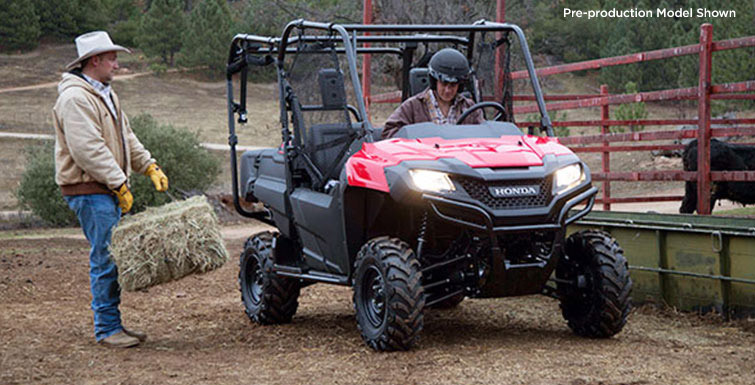 The 2016 Pioneer 700 and Pioneer 700-4 deliver a whole new level of side-by-side capabilities along with incomparable Honda quality and value. 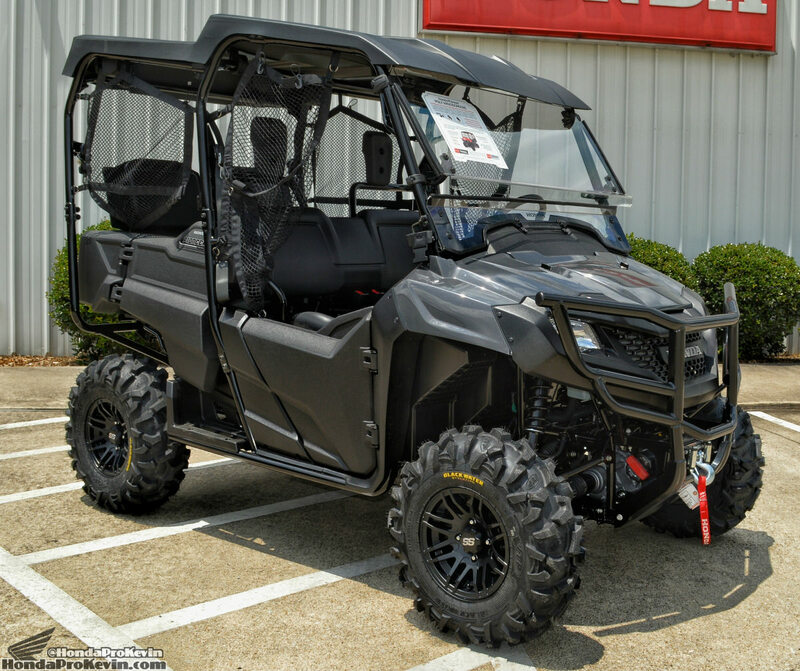 What’s your opinion on the 2016 Pioneer 700-4? Should Honda have changed something? 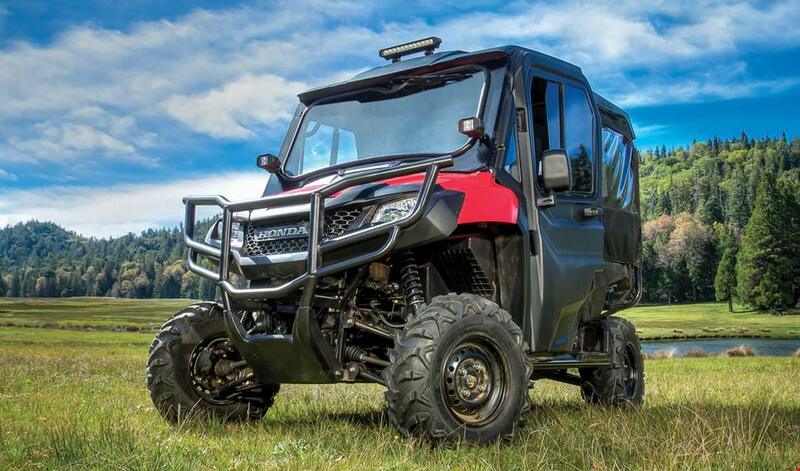 Do you think the 2016 Pioneer 1000 will kill the Pioneer 700-4 in sales this year? 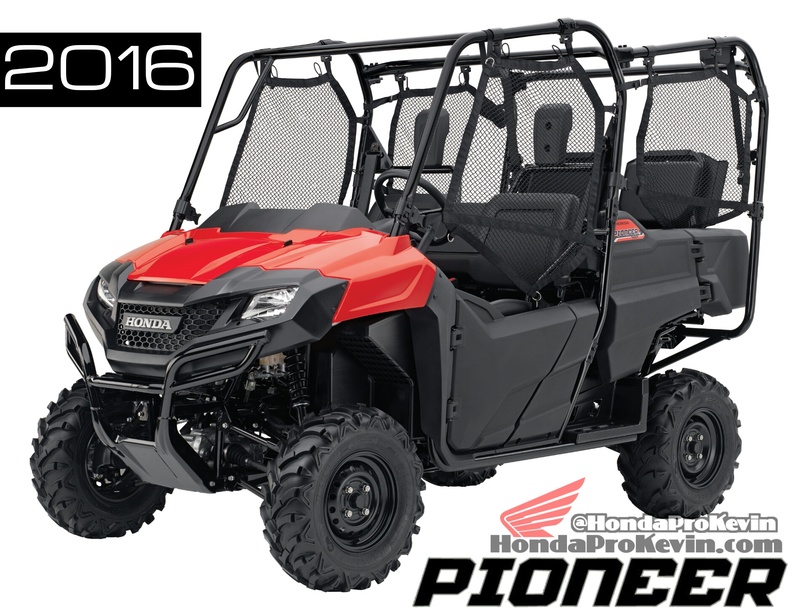 Looking for Honda’s Parts & Accessories that are available for your 2016 Pioneer 700-4? 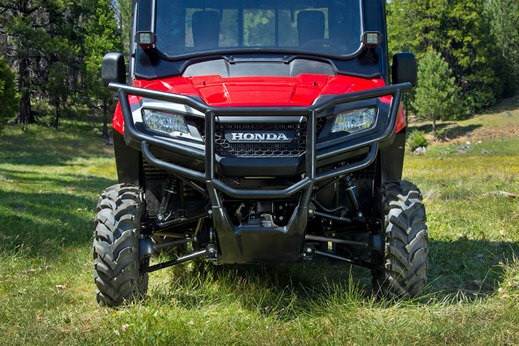 Check out the accessory list below that shows everything available from Honda that will fit all 2014 Pioneer 700-4, 2015 Pioneer 700-4 and 2016 Pioneer 700-4 models too. 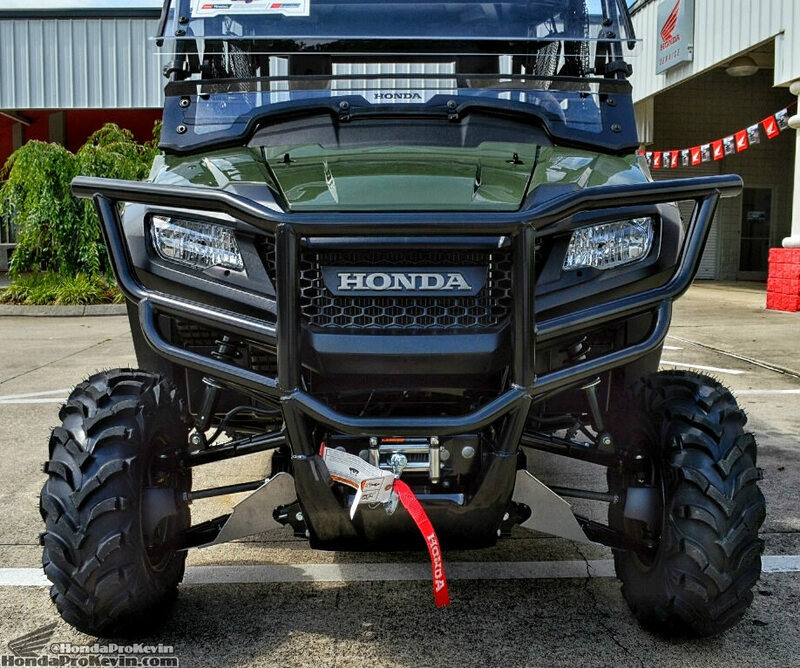 I’ve also included some links to where you can find discount prices to possibly help you save a little money if you’re planning to buy some of the OEM Honda Accessories for your Pioneer 700. U-shaped design maximizes cargo capacity. Strong, durable construction handles almost any job. *Flips forward in the bed allowing tailgate to close when not in use *Gloss – black, powder – coat paint adds a stylish, durable finish *Quick, easy to install. Attaches to cab frame with hook-and loop straps and locking buckles to keep bag secure, items at hand.Seven convenient, zippered compartmentsZipper pulls for easy access*Made of durable polyester *Honda logos show pride of ownership. 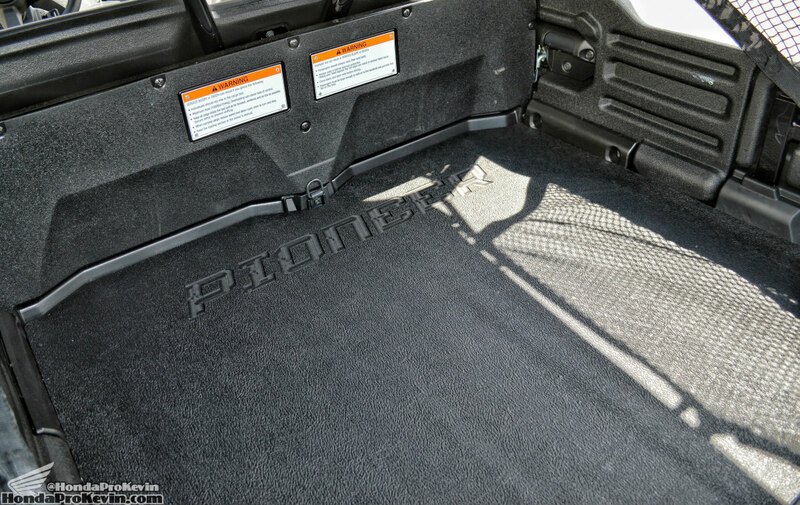 Sturdy liner helps protect the Pioneer’s bed and rear seat area from scratches, dents and dings. Manufactured from ultrarugged polyethylene – extremely durableMolded side slots enables use of partitionsAllows for easy unloading of dirt or other materialsQuick installation and removal. Practical accessory looks cool on the Pioneer, helps occupants stay cooler. Allows maximum airflow through the cabOff-road performance styling*Quick and easy to install, no special tools required. Tight, contoured fit, helps keep mat from slipping and sliding. *Manufactured from rugged nonslip, specially vulcanized rubber compound *Pioneer logo shows pride of ownership. Convenient under dash box provides additional storage. *Easy install/removal with plastic push pins. *No tools required. Precision-manufactured aluminum door frames are lightweight and attractive, and integrate easily with standard half doors.Durable Sur Last ® material is water-repellent adn provides superb UV and abrasion resistance as well as mold/mildew resistance *Double zipped vinyl windows roll down increasing airflow thru the cab *Polished vinyl windows are resistant to cracking in extreme cold *Includes right and left doorsQuick install and removal. Precision-manufactured aluminum door frames are lightweight and attractive and integrate easily with standard half doors.One-piece design is made of durable 600-denier fabric for superior performanceUV fade-resistance *DWR (durable water treatment) for max water repellency *Exclusive Honda Phantom Camo® design matches unit camo color. Occupants enjoy superior protection from wind and weather. Durable SurLast® material is water-repellent and provides superb UV and abrasion resistance as well as mold/mildew resistance *Rear panel rolls up to increase airflow through cabPolished vinyl window resists cracking in extreme cold. 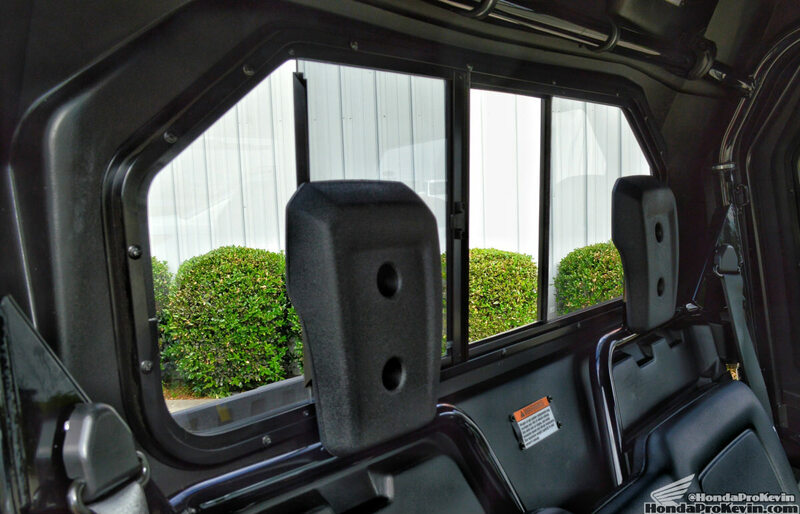 Well-made, attractive panels help keep out inclement weather and enhance comfort of occupants.Durable SurLast® material is water-repellent and provides superb UV and abrason resistance as well as mold/mildew resistance.Zippered vinyl window rolls down to increase airflow through cab. *Polished vinyl window is resistant to cracking in extreme cold. 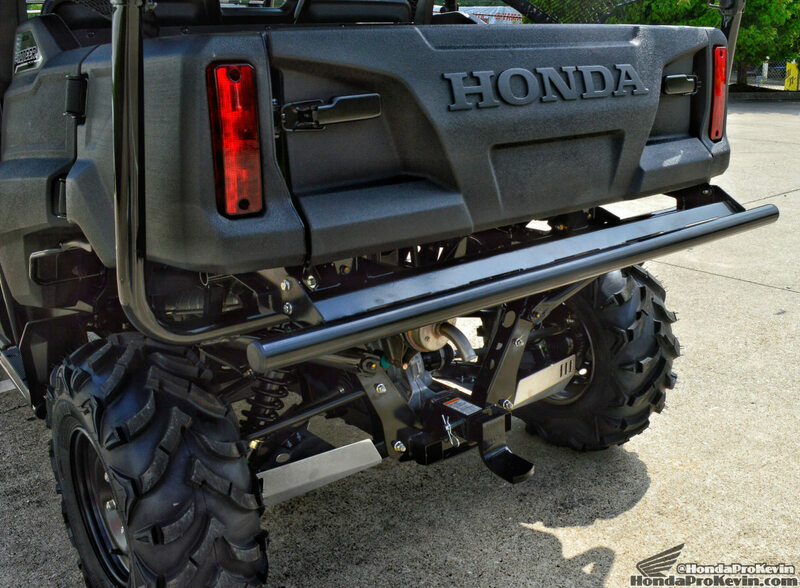 Heavy-duty doors are manufactured from ultra-rugged polyethylene -extremely durable.Automotive-style locking push-button handles and latches add security, convenience *Tempered glass, sliding windows help increase airflowStyled to integrate with vehicle designWorks in a veriety configurationsAccepts Honda Accessory Side Mirrors *Includes right and left doors *Quick installation and removal. 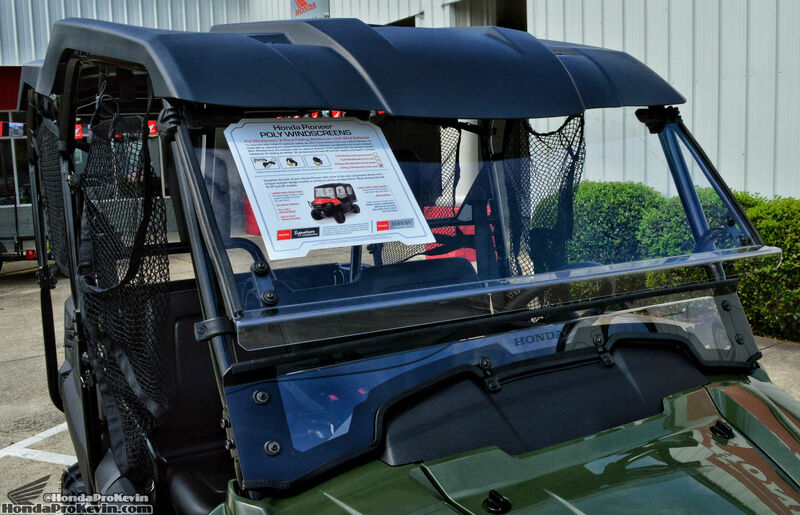 Integrates with Honda Accessory Hard Roof on Pioneer 4P.Manufactured from ultrarugged polyethylene – extremely durableModular design integrates seamlessly with other Honda Accessory cab components *Tempered glass, vented sliding window for increased air flow. Increased driver visibility. Utilizes Honda Tool-Less clamp system for quick installation, quick removal. Adjustable positioning, includes right and left mirrors. Not compatible with Honda Fabric Door or Hard Door Accessories. Required when mounting Honda Accessory Light Bar/Auxiliary Light to lower bumper tubes. Required when mounting Honda Accessory Light Bar/Auxiliary Light to cab frame. 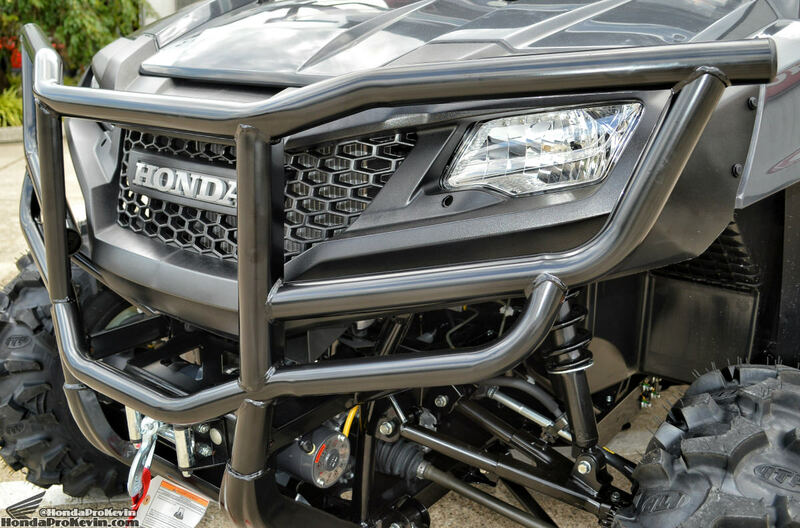 Required when mounting Honda Accessory Light Bar/Auxiliary Light to upper bumper tubes. Required for installation of Honda Accessory Horn Kit and/or Back Up Alarm. Pair of 4” auxiliary lights feature 3-watt Cree LED’s, providing exceptional performance with minimal battery draw.Produce a combined 2,400 lumens in a flood pattern *Rugged aluminum powder-coated housingDurable polycarbonate lensIP68 rated –waterproof, submersible *Requires Honda Accessory Switch Plate/Volt Meter/ Wire Harness *Includes mounting hardware to Honda Accessory windshieldAdditional Honda Accessory clamps available for mounting to Pioneer 1000 bumper (lower tubes -38mm; upper tubes -44mm) or cab frame (41mm). Automatically activates a loud beep whenever Pioneer is put into reverse. Requires Honda Accessory Back-Up Wire Harness. Custom-fit heater helps keep occupants comfortable in cold weather. High-efficiency 153-CFM blower delivers maximum warmth. 4 adjustable vents (2 dash, 2 floor). 2-speed fan switch. Custom fit to your Pioneer. Kit includes all mounting brackets and hardware. Requires installation of accessory Switch Plate/ Volt Meter/ Wire Harness. Easy to install horn assembly. Requires Honda Accessory Horn Wire Harness. 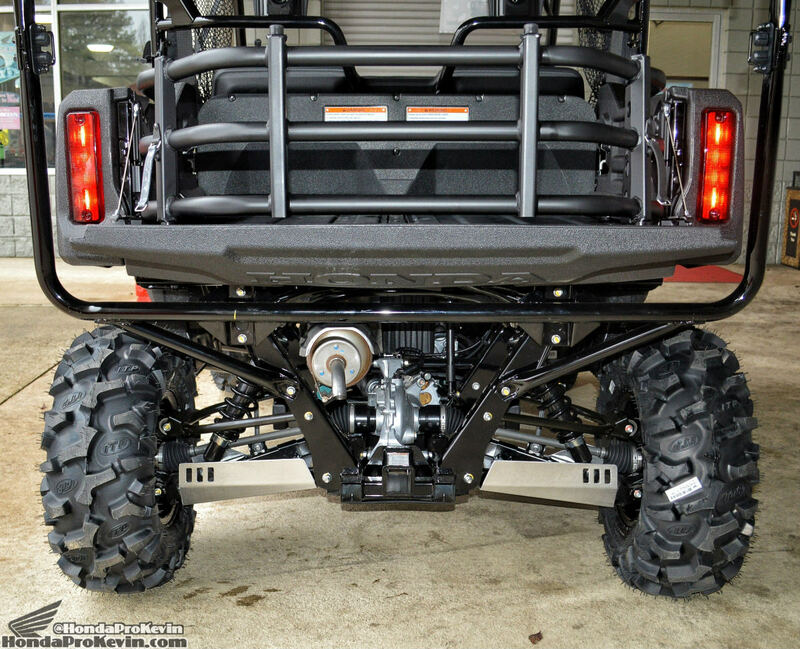 Stylish 14″ light bar features 3-watt Cree LED lights, providing exceptional performance with minimal battery draw. 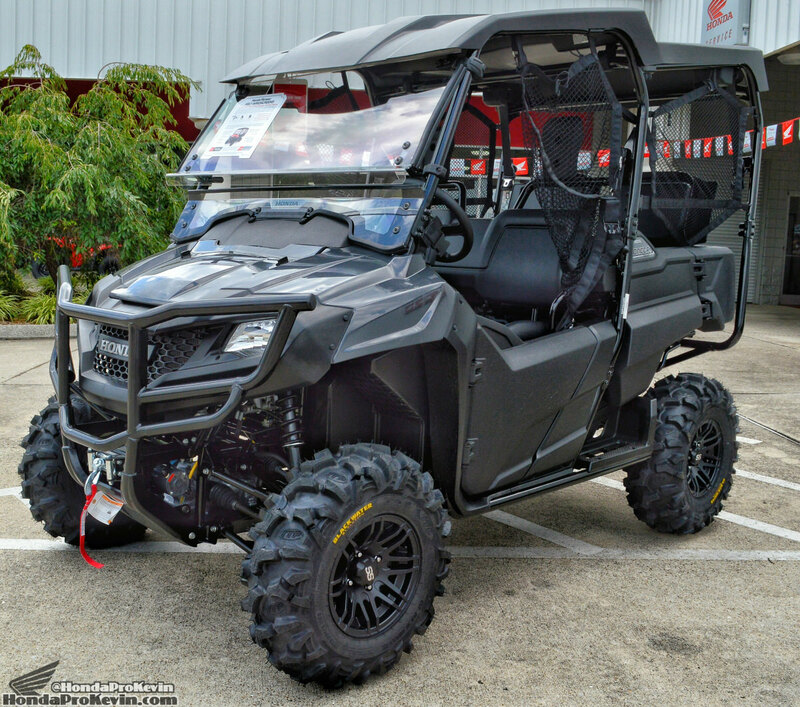 Produces 3,600 lumens in a spot pattern *Rugged aluminum, powder-coated housing *Durable polycarbonate lens *IP68 rated -waterproof, submersible *Requires Honda Accessory Switch Plate/Volt Meter/Wire HarnessIncludes mounting hardware to Honda Accessory Hard Roofs*Additional Honda Accessory clamps available for mounting to Pioneer 1000 bumper (lower tubes -38mm; upper tubes -44mm) or cab frame (41mm). All-in-one system consolidates your Honda Accessory electrical needs into a single source.Switch plate mounts conveniently on dash, accommodates 4 Honda Accessories.Precision Volt Meter monitors power usage, includes customizable HI/LO settings.Plug-and-play wire harness designed specifically for your Pioneer, for quick, easy installation. *Included fuse box mounts conveniently under the hood. Fit over standard front seat/seatback and headrests. *Quick and easy to install, no special tools required. Fits over standard front seat/seatback and headrests. 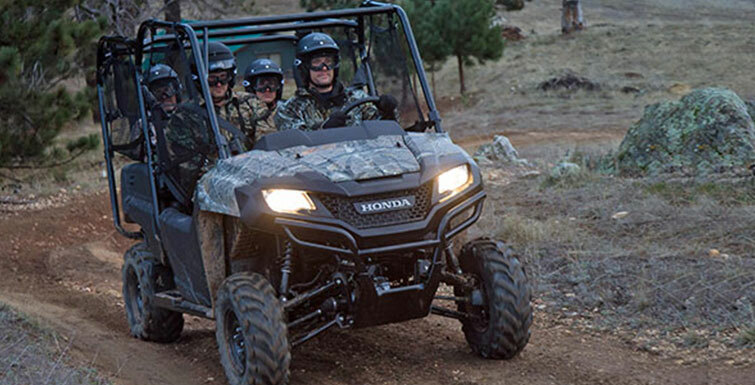 *Quick and easy to install, no special tools required *Exclusive Honda Phantom® Camo design matches unit camo color. Panoramic mirror with excellent visibility.Secure and rigid mount.Uses Honda Tool-Less clamp system. *Quick installation and removal. Tight, contoured fit helps keep mat in place. Manufactured from rugged, non-slip, specially vulcanized rubber compoundPioneer logo shows pride of ownership. Set of two lightweight, brushed aluminum plates provides added protection for rear drive shafts. *Added protection from trail hazards, such as rocks and logs *Quick and easy to install. Set of two lightweight, brushed aluminum plates provides added protection for front drive shafts. 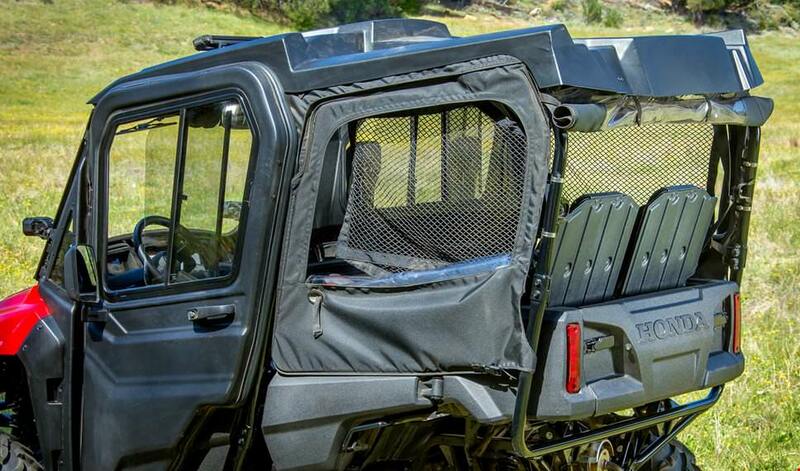 *Added protection from trail hazards, such as rocks and logs *Quick and easy to install. Strong, steel construction adds heavy-duty protection for vehicle front end. *Durable, gloss – black, powder – coat paint *Factory mount points *Quick and easy to install. Strong, steel construction adds heavy-duty protection for vehicle rear end. *Durable, gloss – black, powder – coat paint *Factory mount points *Quick and easy to install. Durable top shuns the sun and helps protect occupants from harsh exposure. *Sur Last® material is water-repellent and provides superb UV and abrasion resistance as well as mold/mildew resistance *Designed to fit over entire cab area *Quick and easy to install. Durable top shuns the sun and helps protect occupants from harsh Exposure. *Surlast® material is water-repellent and provides superb UV and abrasion resistance as well as mold/mildew resistance. 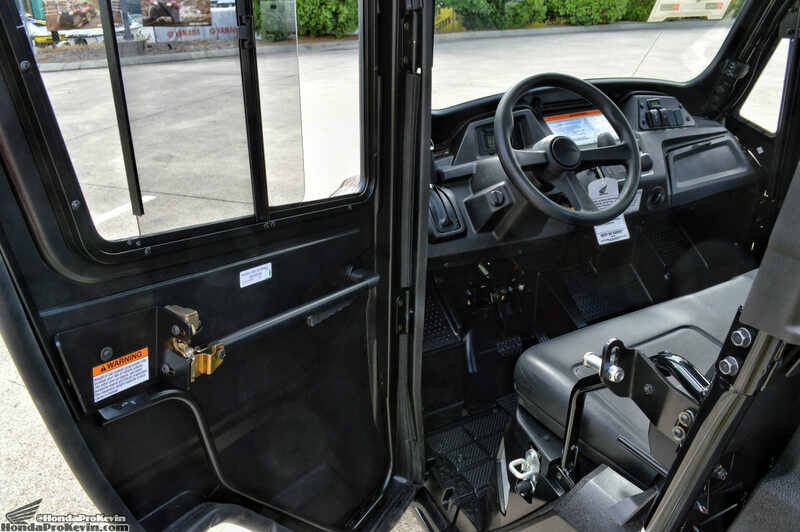 *Designed to fit over front forward cab area. *Quick and easy to install. For superior performance in harsh conditions.One-piece roof is constructed of durable SurLast® material for maximum water repellence and excellent UV resistance as well as abrasion resistance *Mold/mildew – resistant *Fiber rods create a tight, custom fit to the roof while promoting water run offRear panel rolls up increasing airflow through the cab *Polished vinyl window resists cracking even at temperatures as low as -30º F *Requires Honda Accessory Full Poly Windscreen, 08R73-HL3-A00 or 0SR73-HL3-200 or 2-Piece Poly Windscreen, 08R72-HL3-A00 or 0SR72-HL3-100. For superior performance in harsh conditions.One-piece design is made of durable 600- denier fabric for superior performance. *UV fade – resistanceDWR (durable water repellent) for maximum water repellency. 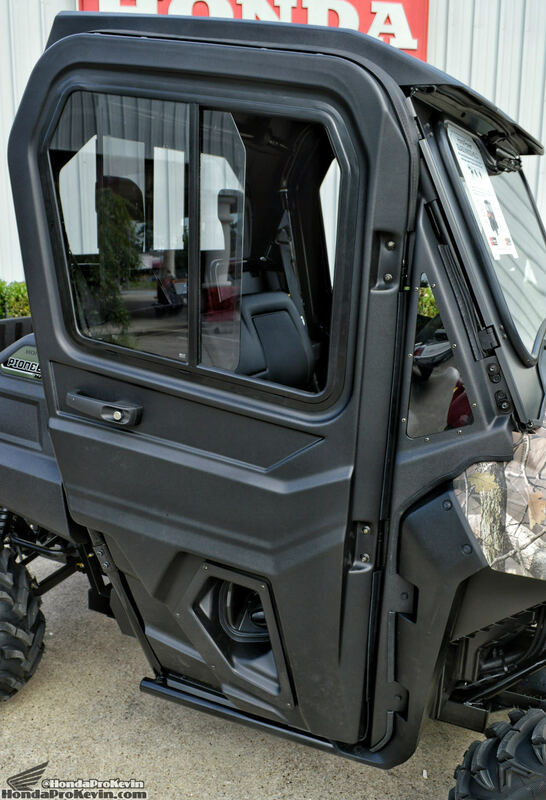 Fiber rods create a tight, custom fit to the roof while promoting water run off.Exclusive Honda Phantom® Camo design matches unit camo color. *Requires Honda Accessory Full Poly Windscreen, 08R73-HL3-A00 or 0SR73-HL3-200 or 2-Piece Poly Windscreen, 08R72-HL3-A00 or 0SR72-HL3-100. Designed to work with Hard Roof (short). *One-piece design delivers superior performance in harsh conditions. *Constructed of durable Surlast® material for maximum water repellence and excellent UV resistance as well as abrasion and mold and mildew resistance. *Fiber rods create a tight, custom fit to the roof while promoting water runoff. *Rear panel rolls up to increase airflow through cab. *Polished vinyl window resists cracking in extreme cold. *Combines with Hard Roof. *Requires Honda Accessory Hard Roof (short) 4P. 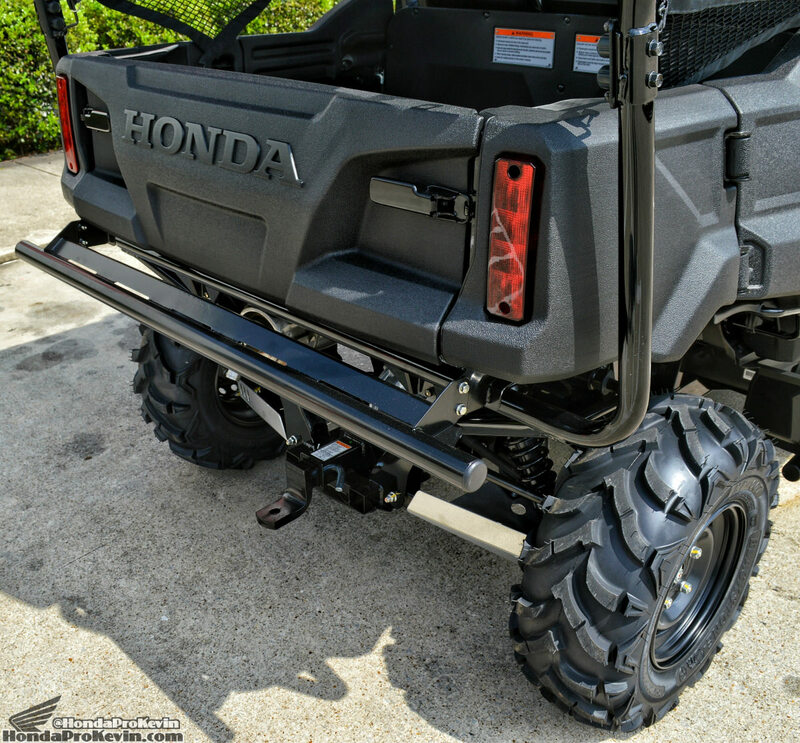 Compatible with Honda Pioneer 700 Accessory windscreens, Hard Roof covers front and rear seating areas of 4P Pioneer.Manufactured from ultrarugged polyethylene – extremely durable.Superior weather Protection.Styled to integrate with vehicle design.Utilizes Honda Tool-Less clamp system.Includes mount points for Honda Accessory Light Bar.Quick installation and removal. 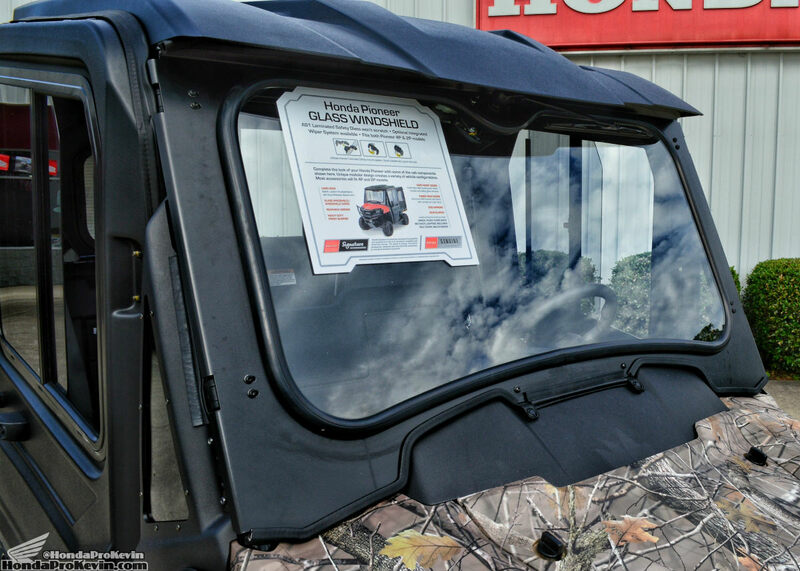 Designed to fit over front forward cab area on 4P Pioneer, Hard Roof is compatible with all Honda Accessory windscreens. (Shown with Fabric Roof/Rear Panel rear section.) 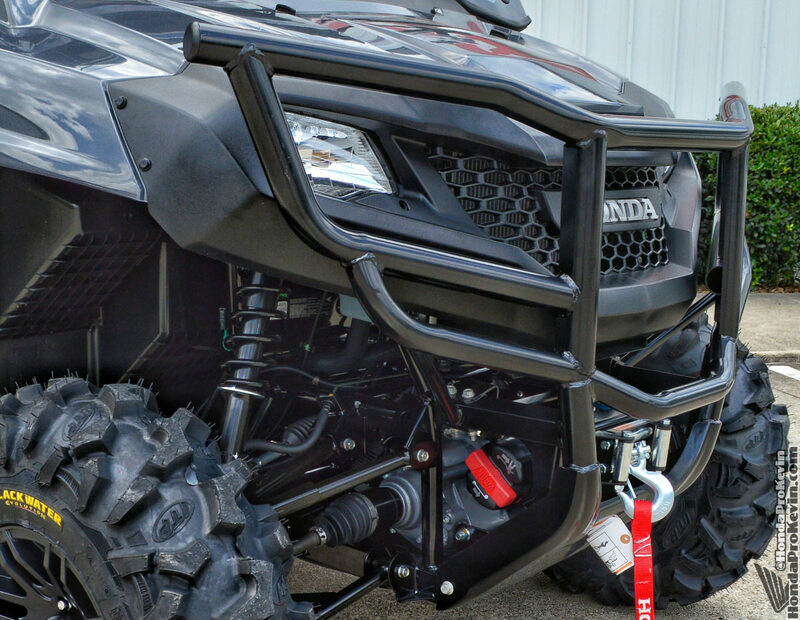 Manufactured from ultra-rugged polyethylene- extremely durable *Superior weather protection *Styled to integrate with vehicle designIncludes mount points for Honda Accessory Light Bar *Quick-release attachment, installs in minutes without tools. Allows installation of 1-7/8” or 2” draw bar. 1-7/8” hitch ball – includes nut and lock washer. Specially coated blade is durable and corrosion – resistant and made to get the job done. 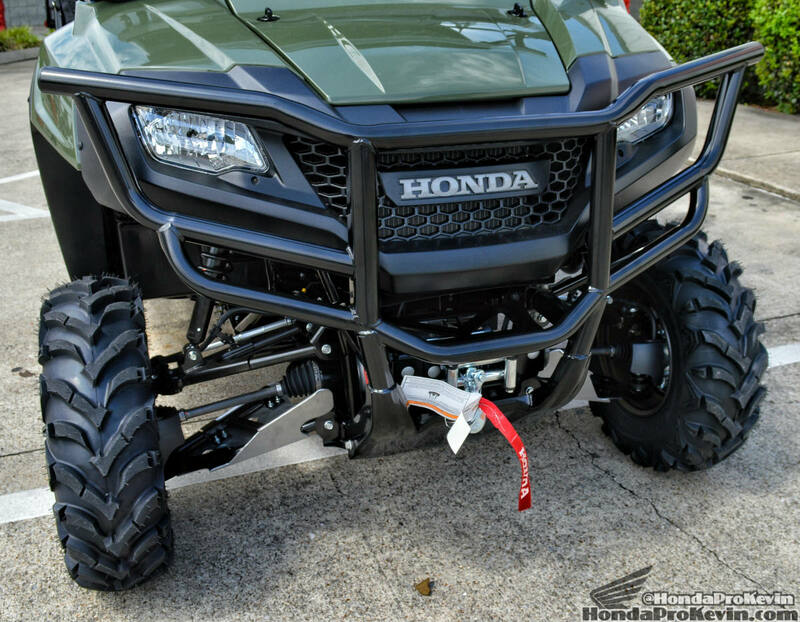 *Shock and impact-resistant *Adjustable gravel skids to control plowing level *Smooth blade – angle adjustment *Requires Honda Accessory Plow Push Tube Set and Honda Accessory Plow Mount Kit *Requires lifting device such as Honda Accessory Winch/Winch Mount Kit. Specially coated blade is durable and corrosion – resistant and made to get the job done. *Shock and impact-resistant *Adjustable grave skids to control plowing level *Smooth blade – angle adjustment *Requires Honda Accessory Plow Push Tube Set and Honda Accessory Plow Mount Kit *Requires lifting device such as Honda Accessory Winch/Winch Mount Kit. 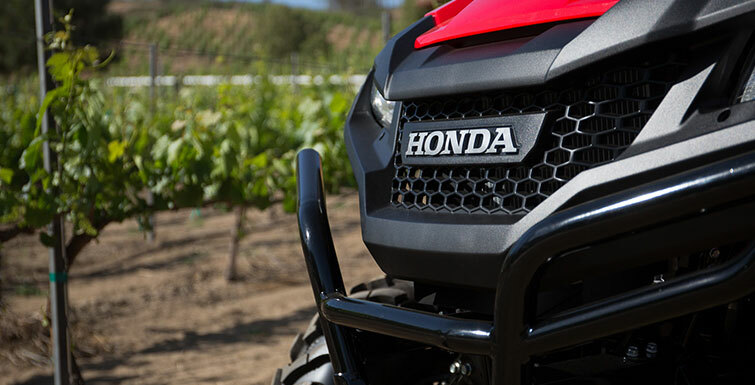 • Durable construction, engineered to perform season after season.• Large base provides effective plowing surface.• Superior corrosion resistance.• Quick connection.• Requires Honda Accessory straight plow blade and plow mount kit. 4,500 lb. 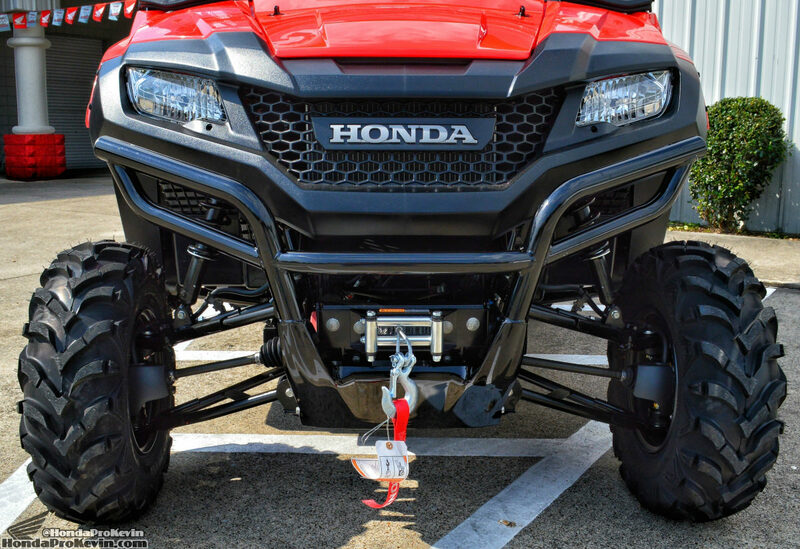 (2,041 kg) of pulling force.Rugged and reliable all-metal geartrain.Fully sealed drivetrain to keep the elements out.Disc brake provides the ultimate in winch control.Requires Honda Accessory Winch Mount Kit.Limited Lifetime Warranty. Two-piece pivoting windscreen allows for increased air flow while hard coating provides optimal scratch resistance. Optical grade polycarbonate construction enhances visual clarityNon-cracking, non-yellowing material for excellent impact resistanceModular design works in a variety vehicle configurationsUses Honda Tool-Less clamp system*Quick installation and removal. Two-piece pivoting windscreen allows for increased airflow while optical-grade polycarbonate enhances visual clarity.Non-cracking, non-yellowing material for excellent impact resistanceModular design for a variety of vehicle configurations.Custom, screen-printed graphics compliment vehicle styling.Uses Honda Tool-Less clamp system. *Quick installation and removal. 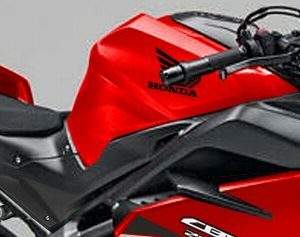 Premium hard coating protects windscreen against scratches, promotes longer life.Optical -grade polycarbonate construction enhances visual clarity.Non-cracking, non-yellowing material for excellent impact Resistance.Modular design for a variety of vehicle configurations.Utilizes Honda Tool-Less clamp system. *Quick installation and removal. 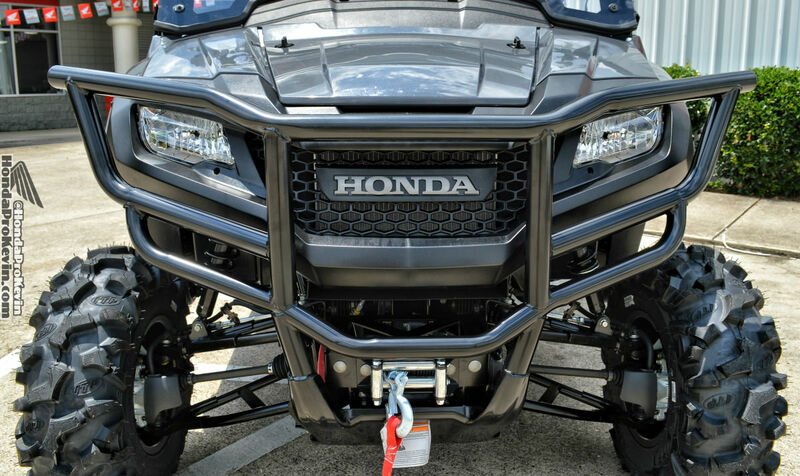 Optical-grade polycarbonate.Noncracking, non-yellowing material for excellent impact resistance *Modular design for a variety vehicle configurations *Custom, screen-printed graphics compliment vehicle stylingUtilizes Honda Tool-Less clamp system *Quick installation and removal. 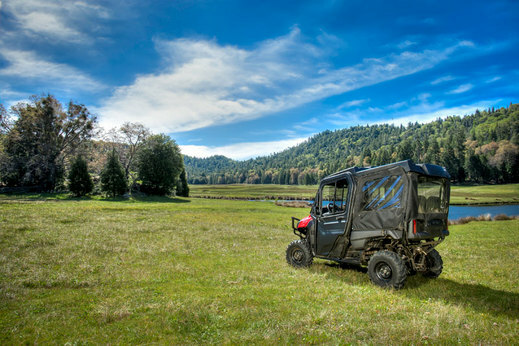 Top-quality ASI laminated safety glass offers protection from wind, dust and trail debris while providing a more comfortable driving experience. *Uses Honda Tool-Less clamp system *Quick installation and quick removal *Shown with Honda Accessory Wiper Kit. Protect from dust, dirt and debris without sacrificing airflow.Optical-grade polycarbonate construction enhances visual clarity *Non-cracking, non-yellowing material for excellent impact resistanceModular design works in a variety-vehicle configurations Custom, screen-printed graphics compliment vehicle styling *Uses Honda Tool-Less clamp systemQuick installation and removal. Add a measure of convenience with wipers that integrate seamlessly with Honda Accessory Glass Windshield. *Requires installation of accessory Switch Plate/Volt Meter/Wire Harness. Honda branded Flag Kit. Uses Honda Tool-Less Clamp for easy, secure installation. 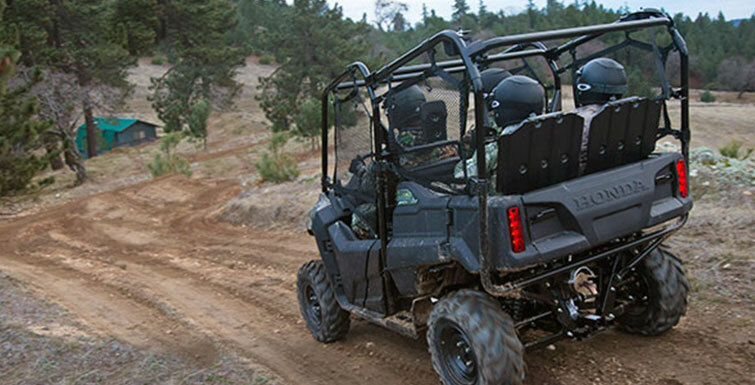 Weather-resistant synthetic material and taped seams help keep Pioneer protected and dry. *Side zippers allow cab access without removing the covers *Honda and Pioneer logos show pride of ownership *Includes handy storage pouch.